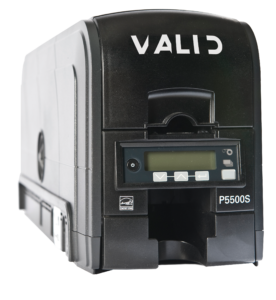 The Valid (Previously Polaroid) P5500S single and dual-sided ID card printer brings plastic card printer manufacturing back to the United States—print quality, print speed, and reliability are unquestioned with this best-in-class printer. It features standard Ethernet and USB connectivity and an LCD display that indicates printer status and easy-to-navigate menu options. The P5500S has an embedded operating system and a browser-based Printer Manager that is accessible through Ethernet or USB connectivity which allows for integration into just about any application or IT environment. The P5500S printer is ENERGY STAR® qualified because it consumes less power, includes an automatic power-down button, and uses biodegradable ribbon cores. New integrated printing technology ensures the screen color closely matches the printed card colors. Get crisp, clean printing results consistently from every card.